As a Florida native with a history of skin cancer in my family, protecting our skin from the damaging UVA and UVB sun rays is a top priority. I wear sunscreen every day before going outside and make sure that my husband and children are using a good sun protective product too. I have used other products from Skin Authority in the past and loved the results. Therefore, I was really excited to try the Summer Sun Duo which features a Sunscreen Moisturizer SPF 30 and Redness Relief. Before using any new sunscreen product on my face and neck (this is where my first skin cancer was discovered) I want to make sure that it is of the highest quality. The Sunscreen Moisturizer SPF 30 fits the bill as it is a multipurpose daily moisturizer, sunscreen and anti-aging cream all in one easy to use product. Anything that is effective and easy to use is a winner with me and it was even selected by Allure magazine as a Beauty Editor Pick! This product uses Supercharged AOX Technology and is made to provide broad spectrum coverage from UVA and UVB rays which is very important when choosing a skin care product in my opinion. It also includes a quality moisturizer that is designed for daily use and an anti-aging cream which makes this the ultimate multi-purpose product. A small amount of this cream goes a long way and it absorbs effortlessly into my skin. My normally dry skin felt softer to the touch and there was no flakiness. There is absolutely no white residue or greasiness which is wonderful….my own skin seemed to drink it in almost immediately after applying it. I also discovered that it uses Dry Finish Technology so it is a great primer for my skin prior to applying make-up because my mineral blush and eye shadow glided on beautifully to my skin and lasted all day. Upon recommendation from the plastic surgeon who repaired my daughter’s face after a slide accident, I apply a small amount of this sunscreen to her scar every single day to help prevent redness. Skin Authority Redness Relief is an innovative product that is a more natural alternative to using hydrocortisone. It was developed to help soothe irritated, reddened skin with a blend of Shea Butter, Aloe Vera, Mango extract, Grape Seed and Safflower Oil. We have used this product a lot since initially trying it out and it is perfect for soothing sunburns, redness and irritation caused by shaving and even those horrible bug bites we got while camping. I like that it is safe to use for the entire family so I can even apply it to my children’s sensitive skin as needed. Right now, they are offering a great deal over at Skin Authority as you can purchase the Summer Sun Duo (SRP $42) which includes the Sunscreen Moisturizer SPF 30 and a Redness Relief which is added in for FREE (a $29 value)! You are invited to visit Skin Authority to purchase your favorite products to get your best summer skin! Connect with Skin Authority on Facebook, Twitter, Pinterest and Instagram. It’s so important to protect the skin and also hydrate it too. I love that it helps soothe irritated, reddened skin with a blend of Shea Butter, Aloe Vera, Mango extract, Grape Seed and Safflower Oil. This looks like very good Sunscreen. I like the redness relief cream because it heals redden skin with soothing Shea Butter and Aloe Vera. What a awesome product to get! I can understand you being very careful to protect your skin, especially because of your family history. My daughter in Australia is paranoid about sunscreen as are most Australians, though now they seem, as a nation, to suffering from a lack of vitamin D! Everything in small doses is ok I feel. Good information, thank you! I am excited by the Skin Authority Redness Relief. I love that it has such natural ingredients. There is a lot of good information in this review. I like the fact that it has a sunscreen, and that it protects and soothes the skin. 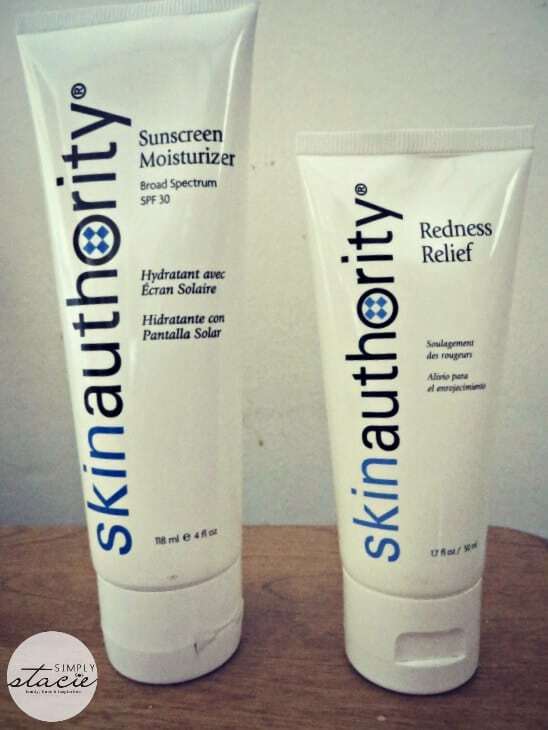 I am always looking for good skincare and suncare products, thanks for introducing Skin Authority to us! I like the ingredients they use. Thanks for the info. I’ve had melanoma, so I can confirm how important sun protection is. This sounds like a good product. Thanks for sharing! Sunscreen is important even in winter or cloudy. The sun can still be dangerous. I like that this is safe, effective, non greasy and feels good on the skin. The redness relief would be great for my husband. I slather on the sunscreen and wear a hat whenever I go out in the sun, I have heard of Skin Authority but I have never used any of their products. I would love to give the Skin Authority Summer Sun Duo a try. Thank you for sharing this post. This is a new brand for me….really curious about the Redness Relief. This may be a good option for my family. If it sits on the skin and is uncomfortable then it’s a battle to get anyone to wear it.